We're remodeling the whole yard at once (it's not very big, and there wasn't anything except rock there to begin with), so the railway has to coexist with the other things that we want, like planter boxes and a patio. One of the fun ways that I found to get a bit more out of the space is to have the trains go through the planter box, instead of around it. Top view of tunnel through planter box, before lid installed. The planter is 3ft by 6ft, 2ft tall, made of 2x12 with 4x4 posts in the corners. I made the tunnel with some extra wood from the sides, so it's 9in wide and 12 inches tall on the inside. The portals are a bit smaller, and I'll probably make scale portals to cover the screw heads around the openings. How will you deal with derailments in the tunnel? Will the tunnel roof be removable (and getatable)? The clearance at the tunnel entrance looks a bit tight maybe. Agree with P playmofire you will either have to widen the tunnel entrance or change the track to be straight or the overhang will clobber the sides. I would make the tunnel entrances at both ends at least as wide as the tunnel. If you can't change the track geometry you will have to make the whole tunnel wider I suspect. You can easily test by running some rolling stock and locos through it powered by the "hand of God" as a dry run. It does look 'tight', but I assume it is early-days and the right of way is not 'set in ballast' yet..
if you can move the curves back a little, square-up the track through the tunnel, and try to run-in a little straighter (square-on) then you might get away with it..
What is the biggest / longest stock you have? I agree that the clearance looks a bit tight, but that may just be a false illusion from your photo, it seems that no matter how much extra I leave at bridges and tunnels, someone seems to come to an open day with something too big. I have had to take a chisel to mine when I have acquired new stock. However if you can get you arm in to retrieve any errant trains and your current stock fits, all should be well. The tunnel through a planter does look like a good idea. Maybe the planter could become a factory with the addition of some doors and windows, etc.. Tunnel portals can be cast in concrete quite easily in a shallow tray type box, 4 bits of 2x1, hardboard bottom and an old cake tin for the hole, using some cheap mastic to make the joint lines in the mould. Or as I have done in the past, cast the basic shape and then just scrape the joints in before it has properly set. I did that with this bridge over our stream which I cast in place. The stream is really the return from our pond filter, to the pond, the pump is off for the winter, while I am rebuilding some of the adjacent railway infrastructure, but hopefully it gives the idea. This has been in place for about ten years and has (i think) weathered in nicely. My worry about a Wooden Tunnel with soil all around it would be the be the eventual rotting of the Timber. Wood in soil and damp has a pretty short life. I would be tempted to put some Stiff Plastic Sheetingof some sort with a small Airgap all around the inside. Or perhaps use Plastic Deck only 1 length probably required for the Tunnel inside. As for access if a derailment occurs, I think at 3ft long it is about at the Max that one could reach in from each end to get at any stock ‘off the road’. Possibly true, but depends on the wood and mostly it matters little if they rot. Bit more serious with a Tunnel, you do not want a load of earth and plants unexpectedly dropping on your prize train in the future! Expect the unexpected (with apologies to Douglas Adams). Why go round when you can go through? (or under!) My house prevented my line from going from front to back garden - down either side was not an option, (path one side, oil tank and boiler the other) so under the house I went! No serious derailments that were not easily sorted - I just made sure the line entered/exited on the straight. 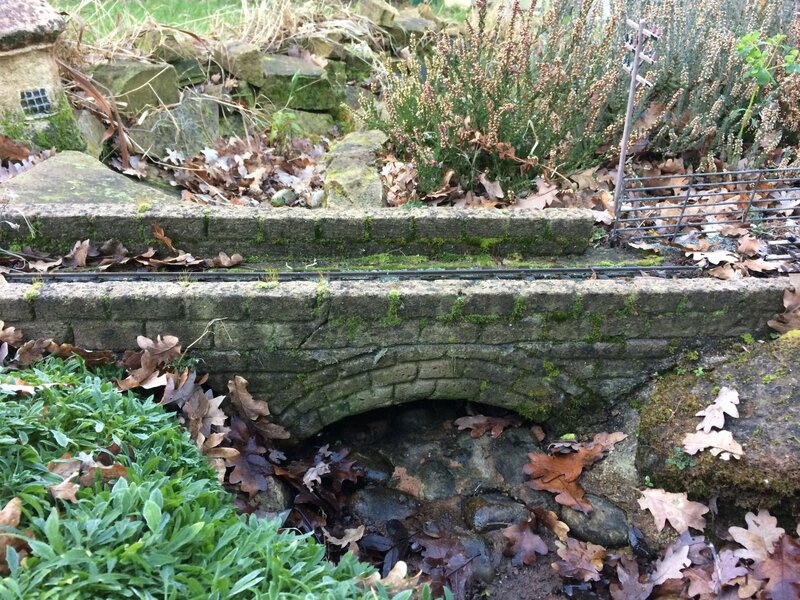 lovely bridge David, and the best part about our hobby - nature makes a better job of weathering than we do! The box is pressure-treated wood (ACQ, so it isn't toxic), and the top of the tunnel will be permanently closed. Pressure-treated wood lasts for a very long time here in California, so I expect it to last long enough that I get bored of it before it falls apart. The tunnel is only three feet long and open at both ends, so I only have to reach a foot and a half in to get to a derailment. I have long arms, so I don't think it'll give me any trouble. At 8" x 10", the portals were sized to give an inch of clearance around my Bachmann Connie, and they don't get much bigger than that! I agree it looks a little small in the pictures; I'll try to take a picture with the Connie for scale when I have some playtime during daylight hours. at the near end of the tunnel, you have a curve at the portal, will will reduce your clearance, and if you run a long car you will be surprised how that clearance is "used up". Finally got some time to do a fit check with my largest engine. It's definitely tight. I have a little room to enlarge the tunnel portal and move the track around, so I'll probably do a bit of both as I get things more settled in. You will also need to keep an eye on things in the future.. Your substrate will settle, over time.. I really like the planter tunnel idea. Wish I had thought of it when I had a garden railway. I don’t have a garden now.